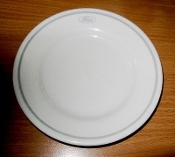 Vintage From Paul is delighted to offer these classic Shenango Ford Motor Cafeteria Dinner Plates. This pattern was used in the Ford Motor Company factory cafeterias (and possibly in the executive dining rooms) and aboard the Great Lake freighter vessels of the Ford Motor Co. Marine Division, operating from 1924-1989. The Ford fleet vessels included theSS William Clay Ford, SS Benson Ford and SS John Dykstra to name a few. Based in Dearborn, Mich., the Ford Motor Company is an American multinational corporation originally founded by Henry Ford and incorporated on June 16, 1903. The Shenango Ford Motor Cafeteria Side Plates measure 9-1/8 inches in diameter. The Shenango Ford Motor Cafeteria Side Plates are marked with " Shenango China, New Castle, Pa, U.S.A., Interpace U-35". Please note the date codes on the plates date to the 1970's.